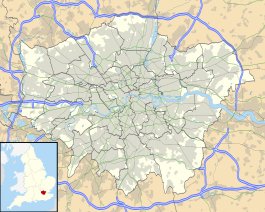 Ponders End railway station is on the Lea Valley line that forms part of the West Anglia Main Line, serving the district of Ponders End in the London Borough of Enfield, north London. It is 9 miles 71 chains (15.9 km) down the line from London Liverpool Street and is situated between Angel Road and Brimsdown. Its three-letter station code is PON and it is in Travelcard zone 5. The station and all trains serving it are operated by Greater Anglia. It is near to Lee Valley Leisure Complex. The railway line from Stratford to Broxbourne, and Ponders End station, was opened by the Northern & Eastern Railway on 15 September 1840. The lines through Ponders End were electrified on 5 May 1969. Prior to the completion of electrification in 1969, passenger services between Cheshunt and London Liverpool Street through Ponders End station were normally operated by Class 125 diesel multiple units (which had been purpose-built for the line in 1958). There is a half-hourly service to London Liverpool Street via Hackney Downs southbound and to Hertford East northbound. On Sundays the service is also half-hourly in each direction, albeit direct to Stratford southbound and northbound towards Hertford East. London Buses route 191 serves the station. ^ "Train Station Information and Network Map". National Express East Anglia. Retrieved 2 January 2010. Wikimedia Commons has media related to Ponders End railway station. This page was last edited on 28 December 2018, at 14:28 (UTC).